Our Inpatient Sepsis Toolkit aims to provide BC inpatient hospital wards with information, resources, and tools to successfully initiate, implement, and spread best practices for sepsis in child and adult populations across BC. Timely recognition of early infection. Early treatment with antibiotics and intravenous fluids. Appropriate escalation to high-acuity or ICU care. In 2014, teams from inpatient units in seven hospitals across BC took part in a pilot project to improve sepsis recognition and treatment. Led by the Sepsis Clinical and Quality Lead from the BC Patient Safety & Quality Council, the Sepsis Inpatient Pilot Project began in early 2015. Throughout the project, teams tested screening tools, prescriber order sets, and measurement tools. The Pilot Project culminated in a full day meeting in November 2015 where teams compared data and provided feedback on the testing and validation of these tools. 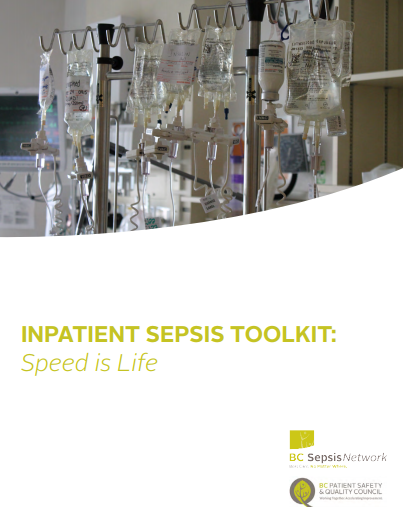 This BC Inpatient Sepsis Improvement Toolkit: Speed is Life was created as a resource to help other teams around the province build from this experience and implement best practices in sepsis care for inpatients across BC. This Toolkit is designed for multidisciplinary teams and clinical leaders working on inpatient wards who want to be able to recognize the signs and symptoms of sepsis early and treat it effectively. While knowledge of quality improvement science is helpful when undertaking any change, the toolkit was developed for those without formal training in quality improvement or change management techniques. Improve the quality and safety of care for patients with sepsis. The resources and tools contained in this toolkit are not exhaustive and sites are encouraged to adapt and build on these resources to suit their local context. Click on the labels below to access the different modules of the Toolkit, or click the button below to download the complete toolkit as a PDF. In February 2016, the Third International Consensus Definitions for Sepsis and Septic Shock (Sepsis-3) were published in JAMA. The Sepsis-3 task force redefined the definitions of sepsis and septic shock (removing severe sepsis from the definitions) – see table below. The purpose of this work was to improve the clarity of the definitions not only for clinical care of patients but also for epidemiology, quality improvement and research. Life-threatening organ dysfunction caused by a dysregulated host response to infection. A subset of sepsis in which particularly profound circulatory, cellular, and metabolic abnormalities are associated with a greater risk of mortality than with sepsis alone. In April 2016, the BCPSQC prepared a special communication on the consensus definitions for sepsis and septic shock to assist clinicians in understanding some of the key changes. For more information and to understand how the new definitions pertain to our work in BC, read the BC Sepsis Network Special Communication in the Toolbox below. Don’t try and go it alone! Get some help by forming a team of people – you’ll be more likely to be successful and sustain your change efforts. Diversity is key: include people with different skill sets, knowledge areas, and perspectives. You’ll want to include content experts, local leaders and those whose work might be affected by the changes you’ll make. Include patient representatives for their unique and valuable insight. Don’t forget to recruit a project sponsor: someone with executive authority who can provide approval for changes, facilitate access to resources, and help overcome barriers. Work with your team to agree on meeting schedules, communication, timelines, actions, and roles and responsibilities. Beyond your core team, think about your stakeholders: those people or groups you’ll need to engage in the project, those who need to be aware of it, and those who need to be involved to help you achieve success. A written stakeholder engagement plan and early communication with them will help you stay on track. Involving a diversity of staff and patients often increases the quality of the new processes or tools, and helps staff become champions of the changes they’ve helped to create. By October 15th, Surgical Ward 3B will correctly identify and treat hospital-acquired infections 95% of the time. Consider the scope of what you are trying to achieve – will you begin on one hospital ward and spread to others? Can you look at similar change projects that were successful and mimic their implementation plan? Are there related projects to build from, specific populations to target first, or constraints such as policies or guidelines that need to be followed? Are there staffing or financial resources to tap into? How will the changes you are implementing affect existing processes or workflows in your organization, such as early warning scores (i.e., MEWS), internal medicine consults, Critical Care Outreach Teams (CCOT), Rapid Response Teams (RRT), or other pathways to escalate the care to a high acuity unit, ICU, or transfer to another facility? Will these pathways need to be included as part of your change processes? As your team begins to test new tools and processes for recognizing and treating sepsis, a good measurement strategy will help you monitor and evaluate your progress. Consider starting with some baseline measurement. How often are the signs of sepsis being recognized? Do they receive treatment that is recognized as best practice? Is there appropriate escalation of care when required? Knowing where you are starting from will make it easier to determine where and when you are seeing improvement after intervention. Collect data as close to real time as possible and display important variables in a run chart over time. Review data frequently with your team. Continue collecting data throughout your interventions and changes. Data will help you know how close you are getting to your aim, to learn what is and is not working, to visualize the impact of your changes, and to share your progress with others. Track patient outcomes and consider gathering feedback from staff who are making changes to their workflow and practices. Looking for patients that were ‘missed’ is an important part of your quality review, and will help you discover processes that need improvement. Consider conducting a time-limited chart audit to look for patients that had sepsis criteria that went unrecognized. Look for patients that deteriorated and required consult or transfer to an intensive care unit that may have benefited from earlier recognition. The toolbox includes a quality review tool to help you stay organized in investigating missed cases of sepsis. We have provided a number of clinical tools to support BC inpatient wards to embed best practices for improving sepsis screening, care, and treatment for both adult and pediatric populations (in regular and clinical teaching units). We encourage you to use these templates and adapt them, through testing, to fit your local context, workflow, and the needs of your patients. Establishing processes for timely lactate testing is important to support identification and management of the deteriorating patient. Ideally, organizations would implement an automatic reporting system for lactate when the lactate level falls outside of a given range. High serum lactate levels are strongly associated with increased mortality in septic patients. Accessing results for formal serum lactate levels may take considerable time in most hospitals. Point of care testing may be available through the ICU or emergency department and could be considered as an alternative process to provide quick access to lactate results. Strong teamwork can reduce adverse events and lead to higher-quality care. Given that communication is the most common factor implicated in adverse events that lead to patient harm, we’ve included a tool to help you communicate your patient’s septic condition to other providers. SBAR (Situation, Background, Assessment, Recommendation) provides a structured and standardized approach for effectively communicating critical information in a way that ensures the message is clear, concise, and complete. Education is important to initiate a clinical practice change and is also vital to help sustain and spread the change over time. An initial step is to identify the learning needs of different audiences and to tailor education to meet these needs. The strategy will vary in each facility and among professions. At a minimum, awareness training (key sepsis messages and orientation to the sepsis pathway) for all nursing and medical staff in direct contact with patients is essential. More detailed training can be provided for direct providers and for those teams involved in escalation of care (eg. Outreach teams, ICU, internal medicine, rapid response teams). Evaluation of the education events can be accomplished using site-specific standard pre- and post-education evaluation processes. Singer M, Deutschman CS, Seymour C, et al. The third international consensus definitions for sepsis and septic shock (sepsis-3). JAMA. 2016 Feb 23;315(8):801–10. Iwashyna TJ, Ely EW, Smith DM, Langa KM. Long-term cognitive impairment and functional disability among survivors of severe sepsis. JAMA. 2010 Oct 27;304(16):1787–94. Mikkelsen ME, Gaieski DF, Goyal M, Miltiades AN, Munson JC, Pines JM, et al. Factors Associated With Nonadherence to Early Goal-Directed Therapy in the ED. Chest. 2010 Sep;138(3):551–8. Fleischmann C, Scherag A, Adhikari NKJ, Hartog CS, Tsaganos T, Schlattmann P, et al. Assessment of Global Incidence and Mortality of Hospital-treated Sepsis. Current Estimates and Limitations. Am J Respir Crit Care Med. 2016 Feb 1;193(3):259–72. Vincent J-L, Marshall JC, Namendys-Silva SA, François B, Martin-Loeches I, Lipman J, et al. Assessment of the worldwide burden of critical illness: the intensive care over nations (ICON) audit. Lancet Respir Med. 2014 May;2(5):380–6. Sweet D, Marsden J, Ho K, Krause C, Russell J. Emergency management of sepsis: The simple stuff saves lives. BC Med J. 2010;54(4):176–82. Dellinger RP, Levy MM, Rhodes A, Annane D, Gerlach H, Opal SM, et al. Surviving sepsis campaign: international guidelines for management of severe sepsis and septic shock: 2012. Crit Care Med. 2013 Feb;41(2):580–637. Neily, J. 2010. Association Between Implementation of a Medical Team Training Program and Surgical Mortality JAMA 304(15): 1693-1700.